Saturday August 13th 1898 Will came for me about ten oclock. It had been raining all morning and it kept showery all day. I felt too tried and unsettled to do much of anything in the afternoon. I let Pink go home. We went to bed early. Sunday August 14th 1898 It was still threatening weather. I was busy all forenoon doing work I had neglected yesterday. I wrote six letters in the afternoon. I read and wrote in the evening. Monday August 15th 1898 We washed and churned this forenoon and I ironed all the borrowed napkins. We went to town in the afternoon. I got some stuff for a waist to take the place of what I lost on Saturday. We came around past Ed Lucas to make a call. It rained tonight. We got evening work done. Thursday August 16th 1898 Pink ironed this morning and I cut out my waist. I sewed all the afternoon. It rained in the forenoon. 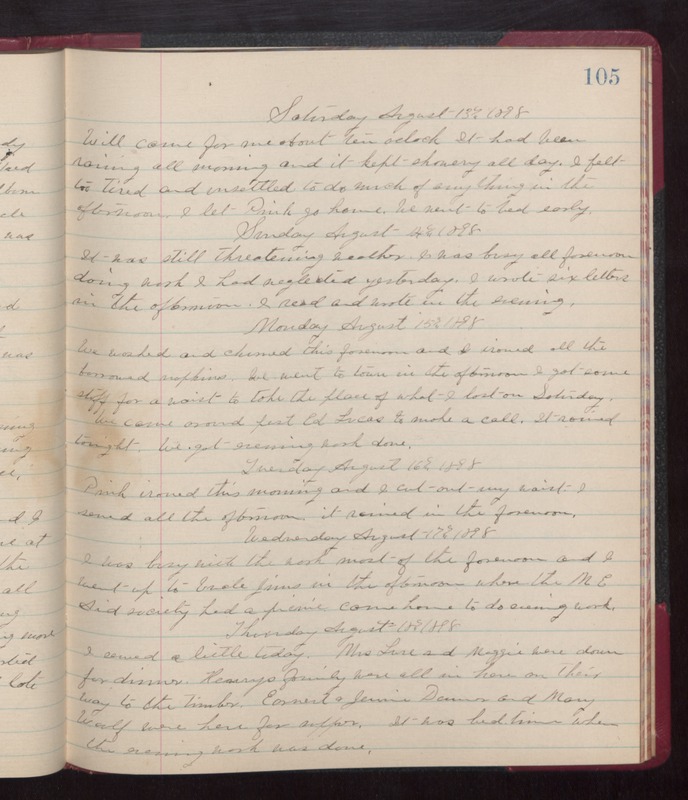 Wednesday August 17th 1898 I was busy with the work most of the forenoon and I went up to Uncle Jims in the afternoon where the M E Aid society had a picnic. Come home to do evening work. Thursday August 18th 1898 I sewed a little today. Mrs Luse and Maggie were down for dinner. Henry's family were all in here on their way to the timber. Earnest & Jennie [Danvers?] and Mary Woolf were here for supper. It was bed time when the evening work was done.